In Japan, the festival for all things cars at the foot of Mount Fuji is quickly becoming one of the must-see events on the motoring calendar, right up there with the Tokyo Auto Salon and the Suzuka Sound of Engine. That event, the Motor Fan Festa, was a lot like last year’s—only a lot better. Part track day, part auto show and part car meet, it’s a whole day of embracing all the things we love about cars. 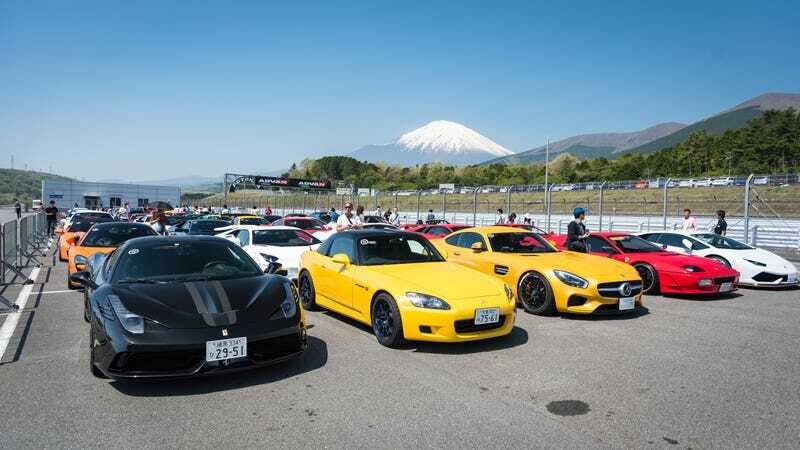 If the Fuji Super Sports Day is an casual day out with friends, the Motor Fan Festa is up there with the big leagues of track days at Fuji Speedway. It’s organized by a bunch of magazines with the cooperation of manufactures, dealers, and clubs for the purpose of bringing all sorts of motoring fans together. For a relatively new event, this year being the third one that’s been held, word has gotten out quickly as crowds filled up the paddocks and most of the parking lots at Fuji Speedway. As you’d expect from an event of the magnitude traffic was an issue but still nowhere near as bad as it was during the NISMO Festival or the Super GT race. Last year, one of the most memorable parts of the Motor Fan Festa was the strong Liberty Walk presence. This year they were still there in full force, only not nearly as many of them showed up. Their special reserved parking area wasn’t full and they didn’t do a parade lap around Fuji like last year. To make up for that, Kato-san brought over some of his bosozoku friends instead which more than made up for it. Instead we had to make do with the usual parade of cars from the guys at Dank and Power Craft Exhausts. Both customers from Dank and Power Crafter were invited to bring out their wild and crazy supercars to make as much noise as they can around the track. In that respect, it was quite similar to the Sound of Engine. Which is handy as both events are 6 months apart. Aston Martin Tokyo also had a track day event to coincide with the Motor Fan Festa. Their customers got a turn out on Fuji Speedway as well on the day with 15 customer cars doing a few laps out on track. Renault also had a similar event—two in fact, due to the large number of cars that came out. I have to respect the people who decided to track their Renault Kangoo vans. But undoubtedly the highlight of the Motor Fan Festa was the Bingo Sports demonstration run. Tokyo’s premiere high-end dealer brought out the heavy artillery to make sure they were noticed. The rarest and most iconic cars brought noise and flames to the track below Mount Fuji. Cars such as the Ferrari 288 GTO Evoluzione, Ferrari F40 LM, Ferrari F187, BMW 3.0 CSL, BMW M1 Procar, Pagani Zonda Revolucion, and Porsche 935 K3 took turns attacking Fuji Speedway to the amazement of the crowds. There aren’t many opportunities for these cars to be seen, let alone heard, so it was truly a special moment. With everyone’s ears recovering from the high-pitched duet of the Zonda and Ferrari F1 car, it was time for a break in the trackside festivities. Some of the cars from the pit garages and paddock were brought out to the main straight for the grid walk. This gave spectators a chance to get up close and personal with the cars. Learning my mistake from last year, I observed from the rooftop above the pit garages this year instead. From above I was able to watch from afar as the crowds poured into the main straight as the gates opened like a flock of sheep. Within seconds cars and models disappeared in a sea of fans. Of course, some of those fans weren’t there for the cars. Wherever there are models posing next to cars there will be photographers, usually sweaty middle-aged men wearing surgical masks, crowding around them. It was a lot like being back at the Tokyo Auto Salon. Once the crowds were cleared, the cars on the Grid Walk then made their way around the track for one lap before going back to the pit garages and paddock. It certainly was a new experience watching a Pandem widebody Ford F-150 Raptor lap Fuji Speedway. Luckily it didn’t roll over. So we had supercars, classic racing cars, bosozoku cars, and everything in between. It was time to make it even more Japanese by adding some drifting into the mix. The D1 demonstration was next on the schedule. It was pretty awesome to see the mass exodus from the main straight towards the track as the crowd gathered to watch half a dozen cars go sideways and make a lot of smoke. Fuji Speedway wasn’t exactly designed for drifting but these guys made the corners work for them. They didn’t drift the whole way around the track, about half way through there was a driver and passenger change. Yes, I wasn’t aware they were taking passengers on for a ride. If I did I would’ve signed up in a heartbeat. The lucky sods. The final event on the track was the “My Car Parade” where people could drive their own car around the whole Fuji Speedway for a mere ¥3000. I regret not taking the Type R around. I mean, it was only a parade lap so they don’t go fast. There was a Nissan GT-R Safety Car leading the convoy but the experience would’ve been awesome. Elsewhere around Fuji, the paddock area had a lot of interesting cars to look at. Most of the stuff displayed there we’ve already seen from the Tokyo Auto Salon, such as the Anija Zonda which seems to be popping up at every event these days. But it was still a cool chance to see them out in the open rather than in a convention hall. As always, there was a nice variety of things from modified GT-Rs, modified Lambos, and of course a lot of different takes on the Jeep Wrangler. It seems no matter where you are in the world, this thing is a mere stone’s throw away. Annoyingly, forged carbon seems to be making a regular appearance in our lives too. I’m not the biggest fan of this fad, I’ve never woken up and wanted any part of my car to look like a kitchen countertop. but I guess there are people out there who do. Presumably the same sort of people with marble countertops. Like last year, the Pandem VW Golf was also on display which is more to my liking. If it’s crazy you want, it’s crazy you’ll get. The Netz Toyota Vellfire based pick up truck that was at this year’s TAS was displayed loud and proud here. Still, as big and ludicrous as this thing was it was still dwarfed by the Pandem F-150. To add a bit of class to the event three (!!!) Toyota 2000GTs were also on show, only one of which was white. The other two were in quite rare and stunning shades of green and turquoise. On the other side of the paddock from the three 2000GTs was a replica of the Initial D AE86. Other highlights included a Volkswagen Golf GTI TCR which looked and sounded awesome. It’s aching for a road-legal conversion. In the pit garages Honda showed their three Modulo concepts which were also at TAS earlier this year. Of course the rest of the cars displayed in the pit garages were racing cars such as the Toyota Yaris WRC and Subaru BRZ GT300. Finally, out past the main paddock and pit garages was another car park where some of the rebel outsiders were found. Famous rotary tuning shop Miyoshi Racing had some interesting wideboyd Rocket Bunny RX-7s on show. One had a Supreme wrap and what appeared to be a new Kodo inspired bumper. The other was, well a shooting brake style RX-7 which made all sorts of excited. Alongside them was a time attack R32 Skyline and perhaps the craziest car of the show; an S14 Silvia. It wasn’t a normal Silvia. Instead of the usual 2.0-liter engine, it had a 2JZ with quad turbos. Just let that sink in for a bit. What other car has four turbos? The Bugatti Chiron? Okay, it’s not exactly like a Bugatti. It has two sets of different sized turbos, the smaller ones kick in a 3800 RPM while the larger ones come in at 5800 RPM. If that isn’t enough, it also has NOS. The engine, if you can call it that, is basically just strapped on to a Silvia body but it doesn’t do a good job of covering it up. The turbos are so big they literally stick out of the body work. The rest of the car looks like some Back to the Future JDM Batmobile. It was bonkers. Japan needs more people, cars and events like this. It’s great to see the excitement for building crazy things like that Silvia and people enjoying seeing crazy things like it go around the track or just as a static display. The only downside was the traffic going back to Tokyo. It’s just unavoidable with these big events at Fuji, but at least people along the way had something cool to see. Why is forged carbon a thing now?